Looking for a Virginia Beach Campground? You have two basic choices when looking for a Virginia Beach campground...or a campground near Williamsburg or any other of the major tourist areas. Do you want to be near the action, or do you want to get back to nature? With that in mind, we've researched major campgrounds in Virginia Beach and found the best ones, then broke them down based on whether they're near the major attractions, or off the beaten path. An amazing sculpture at the Virginia Beach Neptune Festival. When you're done looking for a Virginia Beach campground, scroll down for links to our cheap family vacation ideas, as well as reviews of nearby attractions for your family vacation getaway. RV sites, tent sites, and cabins; maximum length pull through is 60 feet; 50 Amp service available, on site RV Rentals, free modem dataport, swimming pool in summer. Ocean Breeze Water Park near Virginia Beach. The city trolley (the Virginia Beach Wave - click here for details and operating area of the Trolley) runs regularly from this KOA site to the beach in summer. KOA staff will help arrange deep-sea charters, dolphin-watching cruises and other area excursions. Summertime activities include ice cream socials, marshmallow roasts, flashlight candy hunts and hayrides. Nearby attractions include: Ocean Breeze Water Park, Motorworld, and Virginia Aquarium. Looking for things to do near the Beach? For descriptions, addresses, and maps of all the major attractions near the oceanfront, click here. Virginia Beach KOA Campground address: 1240 General Booth Blvd Virginia Beach, VA 23451. Virginia Beach KOA Campground phone number: 757-428-1444. Virginia Beach KOA Campground website: www.koakampgrounds.com/where/va/46109. Not far from the the KOA Virginia Beach campground, this site has amenities that includ six playgrounds, mini-golf, basketball courts, and volleyball court; shuffle board and horseshoe pitches, pavilion covered picnic area, and convenience store. In season: They have four pools and a kiddie pool, game room with video games and pool tables, nightly musical entertainment, hayrides and cartoons for the children; and a snack bar and gift shop. 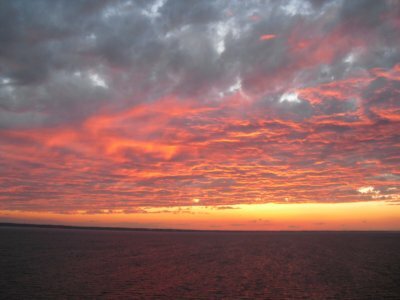 Enjoy beautiful sunsets like this while camping. Want a Virginia Beach campground that's away from the hubbub of the downtown resort area? These campgrounds get progressively more and more remote from the tourist area. This RV's-only Virginia Beach campground is located in Sandbridge, a beach community about 15-20 miles south of the Virginia Beach boardwalk area. It's favored by the locals because it's much quieter and more serene that the boardwalk area. There's not as much to do in Sandbridge (or as many restaurants), but if you like quiet, it's the place for you. Keep in mind that it's really just for RVs: no Vans, Pop-ups or Truck Campers, and there is a minimum RV length of 18'. There's so much to do along the Virginia Beach Oceanfront. Amenities at Virginia Beach RV Resort include 250 sites with full hookups, 24-hour security, a clubhouse complete with a sauna, two pools and a hot tub, tennis courts, boat ramp, cable TV, and more. Beach access is nearby, and it's just a short drive from Back Bay National Wildlife Refuge. Virginia Beach RV Resort address: 3661 Sandpiper Road Sandbridge, VA 23456. Virginia Beach RV Resort phone number: 800-333-7515 / 757-721-2020. Check out some Trip Advisor reviews of the site here. Located north of the boardwalk area, this Virginia Beach campground features climate-controlled cabins, campsites, picnic areas, boat ramps, kayak rentals, and a bicycle trail, as well as 19 miles of hiking trails; guided kayak ecological tours allow exploration of the marshes and bays. It's a good compromise between relative proximity to the action and remoteness. 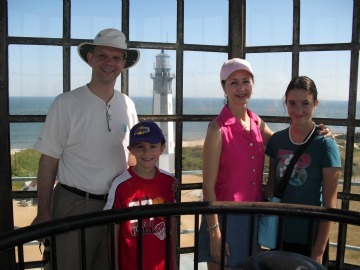 Don't miss Cape Henry Lighthouse near Virginia Beach campgrounds. First Landing State Park is near to Fort Story, a military base with unspoilt beaches and two lighthouses (including historic Old Cape Henry Lighthouse) and the First Landing Cross. For details on Fort Story and the fascinating creatures we like to chase there, click here. First Landing State Park address: 2500 Shore Drive Virginia Beach, VA 23451. First Landing State Park phone number: 757-412-2300/ 800-933-7275. First Landing State Park website: www.dcr.virginia.gov/state_parks/fir.shtml. North Landing Beach Riverfront Campground address: 161 Princess Anne Rd, Virginia Beach, VA 23457. North Landing Beach Riverfront Campground phone number: 757.426.6241. North Landing Beach Riverfront Campground website: www.northlandingbeach.com. What are the must-see attractions in Virginia Beach? 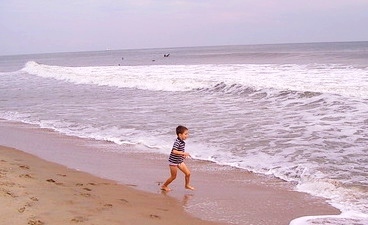 Alex's first visit to Virginia Beach! If you want to visit Virginia Beach, start with our Planning a Virginia Beach Vacation page for a good overview of the area and things to do. If you want to travel beyond the oceanfront (and I really recommend you do! ), our Attractions page will lead you to reviews of museums, mansions, restaurants, and amusement parks in Norfolk, Hampton, Williamsburg, Richmond, and all the way to Charlottesville. And if you're trying to do things inexpensively, check out our Free and Cheap Family Vacation "Hall of Fame" page for free or inexpensive sites and restaurants, as well as our Discount Travel Deals page for deals and tips for saving on gas, hotels, museums, and for getting discount tickets.